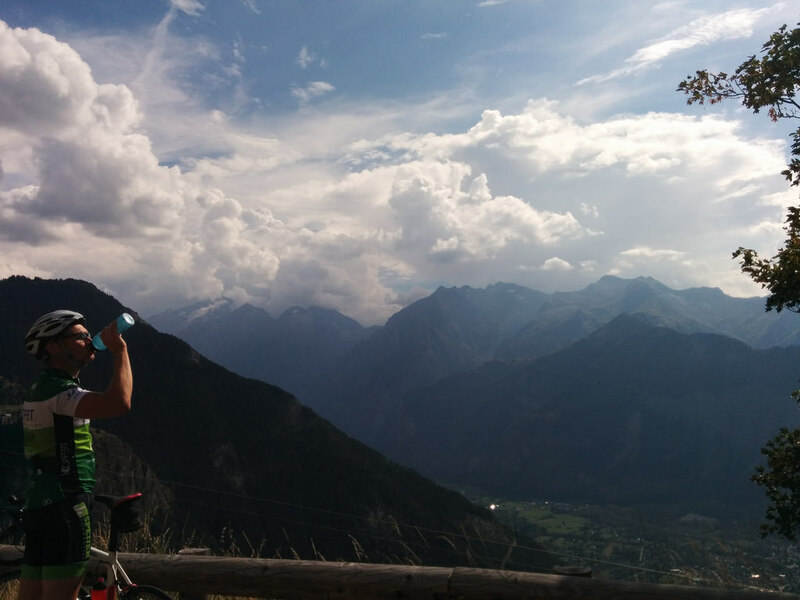 Last september I had my first introduction with cycling in the French Alps. As the majority of the cols I've climbed are in the Mont Ventoux region, having spend two long weekends there, I was really looking forward to climbing some new & iconic climbs in the Alps region. Although I'm more of a sprinter than a climber, I do really like the mountains. It's such a switch up from the flat & windy roads back home. And of course the views are spectaculary breathtaking, something that climbing on a bike shares with hiking. The later being one of my other great passions. Early Thursday morning the four of us set out from Rotterdam by car driving through Belgium, Luxembourg and finally France, with Luxembourg being a mandatory stop to get a full tank worth of petrol at a low price. Most of the route is very similar to that of the Mont Ventoux, however just before Lyon we headed for Grenoble. Arriving at our destination, Oz Station just outside of Allemond, we jumped at the chance to ride our bikes as our were legs have been aching for the entire car ride which took roughly 10 hours. The downhill from Chalet Beyond, where would be sleeping for the next few days, is actually a really nice and a great chance to spin the legs a bit without resistance. Cycling downhill is something I quite enjoy and am pretty good at. It's all the energy you've build up during the ascent of a mountain and you get to release that during a descent in kinetic energy. But it's more then that. Cycling is freedom and going downhill doubly so. There are always some aspects of it that I need to remember again after not being in the mountains for months on end. For instance fear, which can get in the way of you properly ascending and especially during cornering. Fearlessness is also not to be desired however. Your mind needs to be in the middle of the two. It reminds me of Frank Herbert's quotes from Dune, one of my favourite sci-fi books. I must not fear. Fear is the mind-killer. Fear is the little-death that brings total obliteration. I will face my fear. I will permit it to pass over me and through me. On my first descents however I do tend to take it easy. I need to be confident, focused and at the same time be one with your bike. Besides that, technique is something you need to revitalize; it's not that I descent a lot in The Netherlands. Especially how and when to brake, using the apex of corner the right way and the positioning on the bike is vital. It's also very depended on the road conditions and traffic. Dry road surface and no traffic gives you optimal conditions where you can brake late and use the entire road. In many mountain stages a race is won or lost in the descent. After descending the last part of the switchbacks just behind the reservoir near Allemond we settled at a café and enjoyed a well deserved drink with plenty of sunshine which provided us with plenty of Vitamin D. We longly looked forward to the days ahead. Back in the saddle we headed for home, or at least what we would be calling home for the next few days. The climb towards it is not to be messed with. The average gradient being 7 percent but with steep sections of 8-10 percent and a distance of 8 kilometres in which you climb almost 600 metres are not to be sniffed at. Also the fact that we would be climbing this every day we descended it didn't help. Climbing is a part of cycling that stands alone as a discipline. The lightweights own this part of cycling these days but it's not just being light that helps. In my experience it's also a matter of being able to endure pain. Which is something that goes hand-in-hand with cycling. That's probably why cyclist tend to ask for their bike when they crash instead of their mommy. 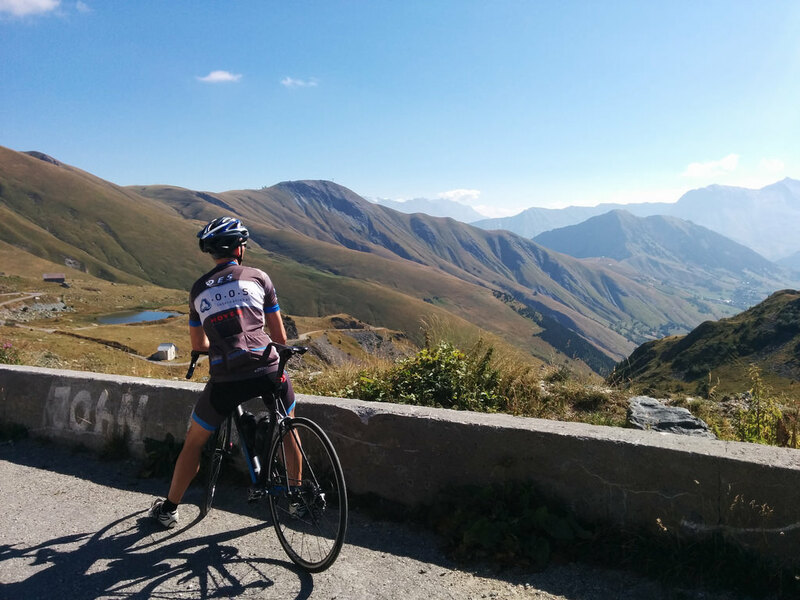 We dedicated our first full day of cycling in the Alps to a relatively easy but longish climb of the Col de la Croix de Fer from the south. Which is very similar to the Col du Glandon however the Col de la Croix de Fer is slightly longer. The climb is 25 kilometres long with an average gradient of 5 %. Albeit that there are plenty of parts that push the gradient to 8 or even 10 percent. Thankfully however you get some respite on the 5 % sections and three descents before the summit. It worth noting though that after the second to last of the descent there is a rather steep section, so the descent feels like a bit of a tease. After this you get to enjoy the amazing mountainous views that open up for you just after the climb above the tree line. It does however mean that you're exposed to the elements. In our case it was mostly the sunshine and that was quite welcome. During this section you'll also get to see one of the many water reservoirs in the region. Nearing the summit of the Glandon you pass one of two restaurants in this area. There is one just shy of the summit and another one at the summit of Croix de Fer. They're very accommodating to cyclists so it's a good place to fill up those water bottles if you need to or have a bite to eat. I believe the one at Croix de Fer is open most of the year and can provide you with shelter if needed. Cycling onward, Arno and I descended a bit together, while dodging some rocks on the road and enjoy the views of mountains and wildlife which mainly consisted of sheep & cows. We passed Stijn, who had suffered a flat tire, and started the final ascent to the summit. This part of the climb was quite easy and we had to wait for Stijn & Marcel, as Marcel was so friendly to stop and help out Stijn with his flat. Something we would be hearing about afterwards. We did end up cycling back a bit and Arno even shot a video of three of us cycling towards the summit again. On the summit we enjoyed a drink at the restaurant and descended back towards our home, of course we did stop for the ascent to the Glandon as that was only a few meters from the first restaurant. After some photos continued with our descend and finally arrived at the last climb towards our home. In hindsight I would say that this was one of the best climbs I've undertaken. It's very diverse in many aspects and that's something I enjoy immensely. Definitely top 5, but I would be adding more climbs during this long weekend to that list. This day would be the biggest undertaking of the holiday. 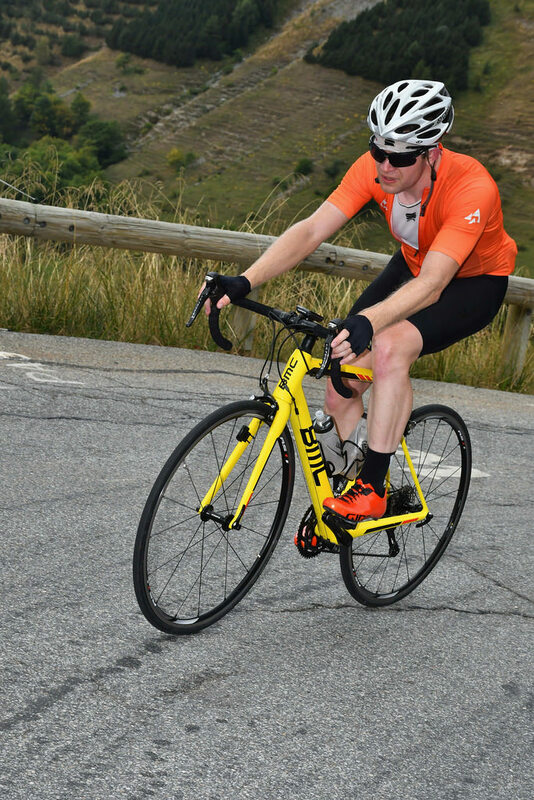 We would be tackling the route of La Marmotte, a cyclosportive held every July with a distance of 174 kilometres and 5000 meters of elevation gain. We however would be riding it without the support that you would normally have during such an event. Heading out from Bourg-D'Oisans, the official start, at 9 in the morning. Early enough or so we thought. The first part was very familiar with the climb being much of the same as the previous day as we climbed towards the Glandon, which is the same route to the Croix de Fer. Marcel, our best climber, rode ahead of us and we soon lost sight of him. Amazing to think he's 49 and still beats all of us in climbing. However he has a good build for it, long and slender. We would see him at the end of this rather long day. Our second best climber Stijn was also riding away from us on the climb but soon suffered another flat, the second of this day. This time we did help out and noticed the issue with his new rims he just got before the holiday. The rim tape wasn't properly applied to the rim and this caused him to get flats. I tried to fix it with self-adhesive patches. A quick fix but this worked for the remainder of the day. We did have to boost Stijn's morale to get him going again. Something I completely understand, I hate getting flats and getting three in two days is horrible. We continued on and soon Stijn was out of sight again. Arno and I sticked together, keeping equal pace, although I know that Arno is the better climber. Just before riding out of the tree line and into the sunshine I had trouble with shifting the front derailleur. It seemed to have a strong preference of only the big ring, I owned a triple back then. As this part of the road had a 9 % gradient my legs didn't appreciate climbing in the big ring, I had to unmount and look what the problem was. After a long stop and with the assistance of some Brits I found out that my STI shifter was broken and could only brake. I fixed the issue somewhat by positioning the front derailleur onto the middle ring, a 39T. Which made my gear selection some what limited at 39x11-28. This cost us valuable time but I still did buy the Brits a drink for the help. Stijn was long gone by then, afterwards we even heard that he had cycled the entire way to the Croix de Fer and only noticed that he went the wrong way just shy of the ascent. He turned back and descended the Glandon but never met us. We would seem him again on Le Télégraphe. After the stop we descended Glandon, during which I missed my 52T ring a lot as spinning downhill with no resistance was very annoying. We refilled our bottles in Saint-Alban-des-Villards. Just after this rather nice looking village we descended even further towards the provincial roads that took us towards the second to last col. This was the most boring part of the entire route and on the hottest part of the day no less. The passing of cars and lorries didn't help much. It made me quite thankful of living in The Netherlands where most of our cycling is done on separate cycling paths. It was more exhausting to ride here than the climbs and also somewhat hard for me due to the limited gear selection but Arno was a boss due to him ride up front into a headwind most of the way. After about 40 kilometres we reached the start of the Col du Télégraphe which is like a appetizer for the Col du Galibier. With some parts between 8-9 % gradient, we caught up with Stijn here and climbed together to the summit. The legs were starting to feel the lengthy day and fatigue was setting in. We refueled on the summit and started our descent to Valloire. In the distance dark clouds were moving in, predicting nothing good ahead. 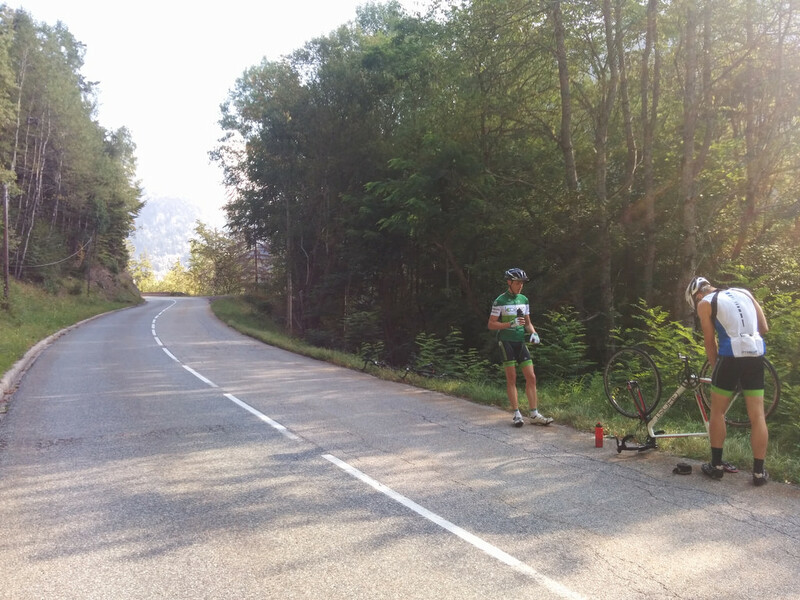 At Valloire we started our climb of the Galibier. The headwind was playing a big part as we cycled towards the foot of the climb and I was lucky enough that Arno blocked some of that wind again as we rode on. I quickly took out one of my last gels (one with caffeine) and sucked it down. This was probably one of the most disgusting gels I've ever had but it worked wonders. As the real climbing now started the rain also made an appearance making the climb even more epic. The landscape around the Galibier reminded me of my holiday in Iceland. Bare rock in the most beautiful way, making the place look rather desolate. It helps to take my mind of the pain in my legs and I get into a rhythm and soon pass Arno, Stijn and other cyclists during the climb to the summit. There isn't room for any rest besides the bends where it eases off slightly for a few seconds. The norm is 9 % here but I finally saw my goal as I steadily moved in closer after every bend. I could see the summit just above the tunnel and that gives me strength and press onwards. 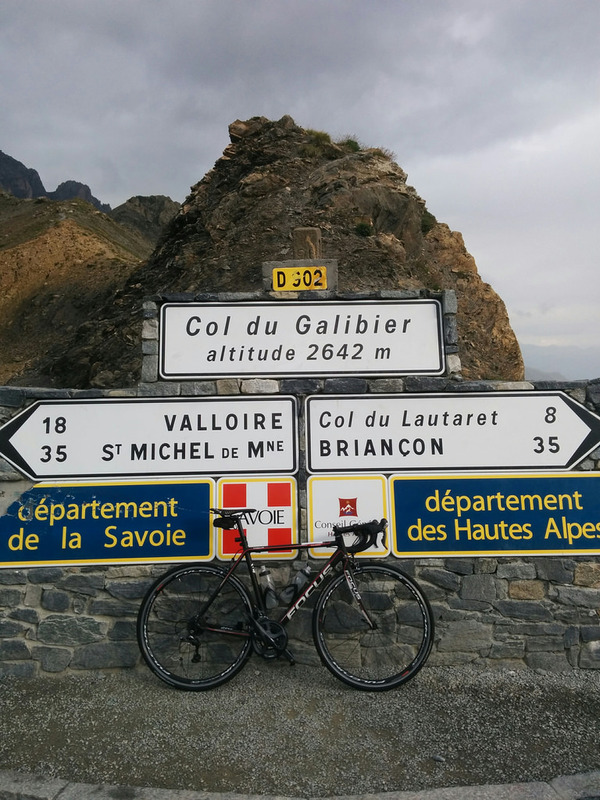 I even got out of the saddle to use my bodyweight for the final push and reach the Col du Galibier. The view was breathtaking but very very cold. This climb definitely deserves a place in my top 3. At the summit I waited for Arno & Stijn, which didn't take that long but long enough to cool me down a lot. I should have never listed to the rest and brought my jacket. While I sweared and blamed myself we snapped some mandatory photo's and descended to the café/souvenirs shop. Where we warmed ourselves up with some hot chocolate milk and tea. The rain had increased and we were dreading going outside now. The French guy that runs the place asked & recommended us to buy one of his cycling jacks but the prices were insanely high and looked like they were stolen from the 80's. I however asked him for le journal and we divide the pages between ourselves to put under our jerseys in the chest area. An old school hack for staying warm. The descent turned out to be a teeth chattering ride all the way down and even though the rain soon stopped, the road was soaked. Making this not the most relaxed descent but still doable by going slowly. Nonetheless this it was a beautiful decent and I can imagine that the climb from this side should be quite beautiful too. Stijn did slide out during one of the last corners but he wasn't hurt much. Rather flabbergasted how it had happened at all. We soon rode on and were getting to the parts were the tunnels past through the mountains (bike lights are handy here). The road stayed wet for the most part towards Alpe D'Huez but at least we kept a good pace until just before Lac de Chambon. Roadworks made us divert from the main road and forced us to go over a temporary road on the other side of the lake. Darkness was starting to set in now and it dawned on us that we would not be completing the sportive with the final climb up Alpe D'Huez. We did end up riding towards the beginning of the climb just to see what we would be climbing in two nights. We headed for Bourg-D’Oisans instead and ended up in a restaurant. Here we waited for Marcel while we refueled on a four-course meal. During all this Marcel climbed towards the chalet. What a die-hard! I can't imagine what the pros go through when they ride day in, day out and have to endure these conditions. Even amateurs riding the Marmotte. I know it's easier with more riders, that way you can jump from group to group and recover. And of course food is taking care of. Still plenty of respect for those who have completed the Marmotte. And even though I didn't finish the Marmotte I'm quite sure I could do this too without all the setbacks. I'm certain I'll return one day to complete it properly. On our "rest day" we slept in, having a late breakfast and gave our bikes a good cleaning. My front mech was still stuck in middle gear but that didn't deter me from using my bike that day. We opted for a balcony route from Bourg-D’Oisans to La Berarde. We robbed the local boulangerie from some really taste baked goods like croissants and chocolate eclairs before we chased the pavement again. This route took us over the provincial road but by takes a side road with barely any traffic. Then the road went up through a very forested area but the incline is tough with 13 %. I died a bit here but the rest of the route is only 5-8% in this rather beautiful mountainous area. The crêpes for lunch and snow covered peaks at the end in Berarde were worth it all. I highly recommend this balcony one-way route to anyone in the area but ask a local about the accessibility. Stijn did get a flat again though. 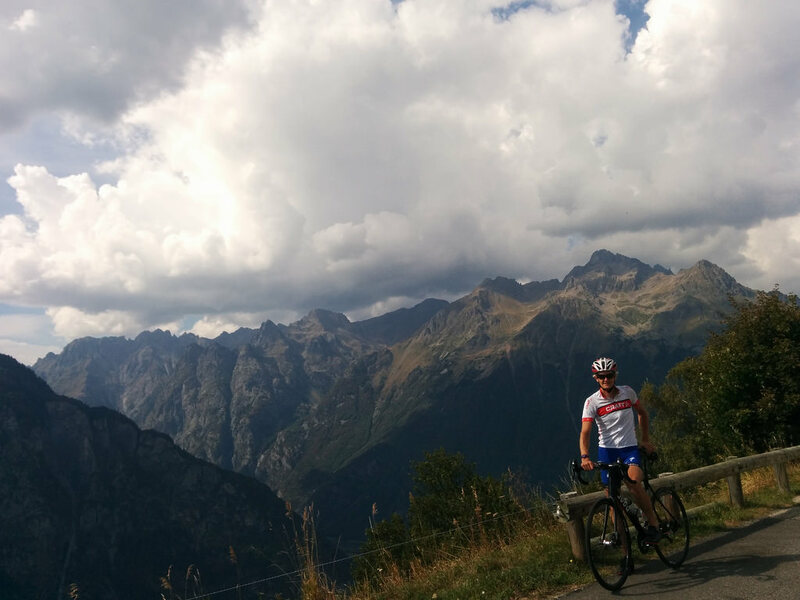 On our final day in the Alps we cycled from the chalet to Bourg-D’Oisans where I rented a bike that had proper gearing to take on Alpe D'Huez. I got this rather stylish yellow BMC Timemachine SLR03 with 50/36 - 11-32. And Stijn finally got his rim tape replaced, making him very happy camper. Just shy of the first part of the climb I dismounted to retighten my shoelaces. It just climbs so much better. Right away the pain of climbing sets in. This mountains is tough from the get-go and I'm felt the longish weekend in my legs but I also noticed the more relaxed gearing that helped me somewhat. I never used the 32 anywhere but it's still quite nice to know you have the option to use it. Alpe D'Huez isn't a beauty though and its popularity is something that I still question. It pales in comparison to climbs like Galibier, Croix de Fer and Mont Ventoux. In the ski village I rode through the tunnel and unmounted at the official summit end, I setting a time of 1:11:11. My friends were waiting for me and we cycled on to the very top which is Col du Poutran. We rested a bit and took in the last rays before we headed down via bend 5 (or was it 7...I can't recall) towards Villard-Reculas. Another balcony route that has quite a view. Ending up at the last climb of the weekend towards our chalet. We cleaned ourselves up and drove to Bourg-D’oisans where I pickup my dearest in exchange for the yellow BMC. I miss climbing but more so The Mountains. This blogpost was a long time coming, having not blogged in ages. Hopefully I'll be a bit snappier with new posts in the future. Thanks for the proof reading René. 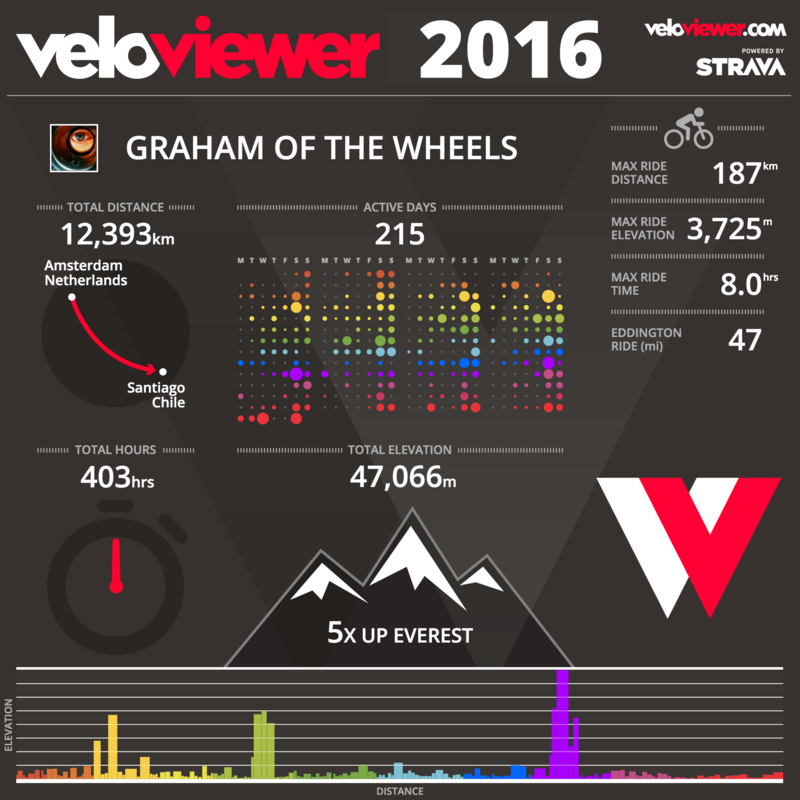 Below is my cycling YTD (Year To Date) of 2016 and of course links to the routes and photos.